"This is an easy vegan vegetable curry with just enough spice! The lentils are filling and you can add any vegetables you have. Spinach leaves add extra color and flavor." Heat olive oil in a large skillet over medium heat and cook onion, chile pepper, and garlic, stirring frequently, about 5 minutes. Stir in cumin, curry powder, ground coriander, and turmeric and cook until heated through, 1 to 2 minutes. Stir cherry tomatoes, lentils, and water into the pot. Season with salt, stir well, and simmer until lentils are almost cooked through, about 20 minutes. 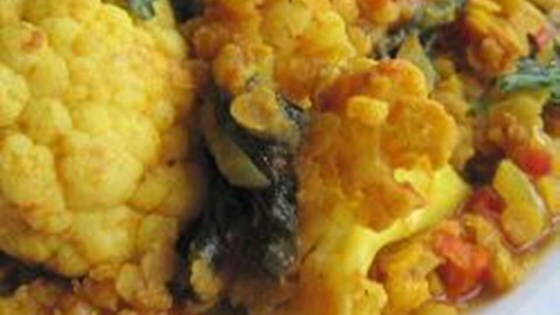 Stir in cauliflower and spinach leaves, cover, and cook until cauliflower is soft and spinach is wilted, 10 to 15 minutes. Serve with freshly chopped cilantro. You can substitute 2 chopped whole tomatoes for the cherry tomatoes.